(Nanowerk News) Vaccine technology company Vaxxas has moved a step closer to achieving its goal of improving world health, thanks to a capital raising of $25 million. The company, a start-up of The University of Queensland’s UniQuest commercialisation company, has attracted the funding led by Australian venture capital firm OneVentures in its series B fundraising to further the Nanopatch. The Nanopatch, invented at UQ’s Australian Institute for Bioengineering and Nanotechnology by Professor Mark Kendall, seeks to replace traditional needle and syringe methods with a small patch that delivers vaccines painlessly. 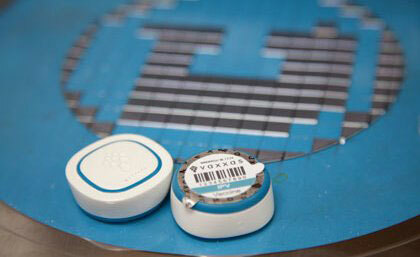 The Nanopatch applicator and a large version of the patch. In 2011, UniQuest, working with Professor Kendall, founded Vaxxas to advance the Nanopatch towards being a clinically-proven product. “This investment is a key next step in advancing a series of clinical programs and develop a pipeline of new vaccine products for major diseases using Vaxxas’ patented Nanopatch technology,” Professor Kendall said. “The Nanopatch has the potential to improve global health. “The technology is the size ofProfessor Mark Kendall demonstrates the application of the Nanopatch. a postage stamp, and has thousands of small projections designed to deliver the vaccine to abundant immune cells in the skin. Deputy Vice-Chancellor (Research) Professor Robyn Ward said the significant investment demonstrated the high quality of research coming out of UQ. “The Nanopatch is an excellent example of the practical research UQ experts are tackling,” she said. UniQuest CEO Dr Dean Moss welcomed the funding. “UniQuest is delighted that Vaxxas has been able to raise funds in a Series B venture financing round from existing and new investors, taking the total capital raised by the start-up company to $40 million,” he said. “There is huge potential with this technology, if successful, to improve health world-wide.